We help our clients create an oasis where they could retreat back after their long day at work, where their children could grow and thrive, and where they entertain their close friends and extended families. Most of our clients are corporate executives and professionals with big work and family commitments. We help them plan and manage their building works so they can enjoy their beautifully finished home without taking time off work and family life. Our services are tailor made to the needs of an individual client. Our approach is to integrate the life that happens inside with the architecture, interior and landscapes from the outset of the project and to provide a holistic design and project management solution rather than the sum of its parts. INTERIOR ARCHITECTURE & DESIGN Full design service to aspirational individuals: from the initial concept, space planning, technical drawings & specifications to tender management, FF&E procurement, project administration and completion of a building project. INTERIOR DECORATION Decoration service for a project that doesn’t involve building works: Similar process to Interior architecture & design plus it could include finishing touches and art direction. ONLINE INTERIOR DECORATION Travel inspired online decoration package: The bespoke package includes a priced list of furniture and furnishings with room set images, suggestion of paint colours, wallpaper and fabrics. Whether you are looking to redecorate a single space or redesign your whole home, Claudia pays exceptional attention to detail. Her passion for interiors guarantee that she will create something both special & unique just for you. Claudia developed her interior design skills over two decades by investing in and upgrading properties in London, Germany and France. Claudia trained at the Inchbald School of Design, turning her passion for renovation, decoration and furniture into a profession through Claudia Interiors. As well as supporting clients across the world, Claudia lectures regularly about her past projects at the Inchbald School of Design. She is also fluent in German and French. Claudia welcomes clients to visit her showroom which offers the ideal opportunity to view at leisure a luxurious selection of items from Claudia’s favourite suppliers as well as a glimpse of Claudia’s decorating skills. Claudia’s showroom is the exclusive and only showroom in the UK to display the beds and mattresses by the luxury French company Treca Interiors Paris (/www.houzz.co.uk/pro/trecainteriorsparis/treca-interiors-paris) who make handmade bespoke luxury sprung mattresses and toppers of the finest natural materials as well as a broad range of traditional and innovative bedbases, including articulated and storage box bases at attractive prices. Founded over twenty years ago, husband and wife interior designers, David and Diana Hales have brought together a small team of enthusiastic and talented individuals who are committed to design excellence. 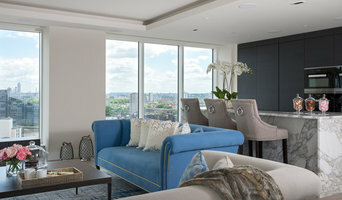 David Hales Interior Design is synonymous with exceptional interiors, delivering elegant and sustainable solutions. Our design team are enthusiastic and talented individuals, working together with leading architects, contractors and suppliers throughout the country. We pride ourselves on creating refined and detailed design solutions, taking a project from initial conception through to the finished product. Our aim is to make everyday living comfortable, engaging and inspirational, creating designs that are both sympathetic and appropriate to the building, whilst ensuring they reflect the personality and wishes of our clients. David has the ability to view a project from both an architectural and design perspective, facilitating creative space planning unique to our studio. Combining David’s wealth of experience with a young dynamic team we commit ourselves to design excellence. Ensoul is an Award Winning architectural design and interior design firm that transforms residential properties into beautiful & intelligent homes. Our philosophy is the exact definition of our name which means “to endow with a soul”. We offer a seamless home extension and refurbishment service from conception through to completion whether it is a home for you to live in or an investment property you are looking to sell or rent out. We also work on new builds too. Some of our clients come to us for luxury refurbishments that are led by our interior designers and require our design, decoration and buying expertise, with no significant structural work. Others come to us for our architectural expertise in redesigning space and creating new extensions including basements, loft conversions, rear extensions and side returns. At the heart of everything we do is an unrivalled customer service ethos shared by a highly skilled team of design, build and project management professionals with over 100 years of combined experience. Our clients work late hours and across different time zones, which is why we take care of every detail from start to finish and offer flexible access to our team around each client’s schedule and availability. Our talent is in creating luxury spaces that connect with our clients. Each one is designed to be contemporary, beautiful, highly functional and at the same time wholly personal. We are masters of combining interesting architectural features, clever space design, confident colour and texture with the latest in smart home automation technology and security. We are proud to have our work regularly featured in the press and awards. “A vibrant showpiece.” “Something rather special.” “Attention to detail & clever use of colour” are just some of the things the London Evening Standard has written about us. “Truly delicious design” according to Beautiful Kitchens Magazine. And The Telegraph described one of our latest projects as “The ultimate high-tech home.” For those looking to add value: “If you’ve got a space that’s really unique and well-designed, that’s when you really increase the value of a property. Clever design is what creates bidding wars. It’s what makes somebody walk into your property and say, ‘I have to buy this.’" Viki Lander, Creative Director at Ensoul quoted in The Times. LLI Design offer a comprehensive design service, creating beautifully crafted interiors for discerning clients. At our studio in Highgate, London the creative team is led by Design Director Linda Levene. Her background as a fashion and textile designer is reflected in her love of form, texture and colour. Since LLI Design was founded in 2006 we have been committed to delivering exceptional, comfortable and individual homes that give enduring pleasure. Linda will lead your project from a planning and creative point of view, supported by her team to assist with drawings, budget and project management. Our creative team's attention to detail and meticulous care, result in luxurious bespoke interiors that often exceed our clients' dreams. We truly believe that good quality design is life enhancing and deliver it in every project we undertake. Each project is seamlessly executed and beautifully finished, no matter how large or small. Visit our website and book a consultation! 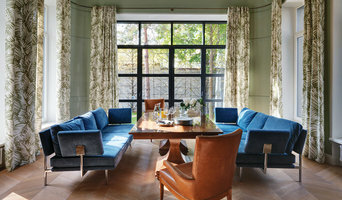 Rosie Winston has been leading the thriving Clifton Interiors design practice for over 30 years. 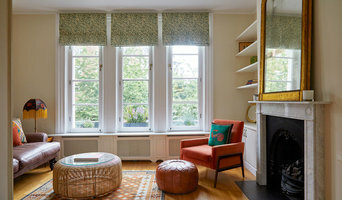 Situated in London’s Primrose Hill, Rosie and her team offer a comprehensive design service, incorporating all aspects of interior architecture, lighting design, spatial planning, procurement, build and decoration as well as landscape and garden design. At Clifton, attention to detail in design is carried through into meticulous project management. With an established network of trusted specialists, the highest quality of workmanship is ensured throughout all projects. Working closely with Rosie and her team of designers, clients will be treated to a comprehensive personal, reliable and professional key hold service of top quality design and project management that fulfils their requirements and achieves their aspirations cost effectively. Rosie’s experience and expertise is showcased throughout her portfolio which includes a wide range of private and commercial interior spaces across London and abroad. Her eclectic and contemporary style is displayed on her projects as it is adapted and tailored to suit her client’s individual needs. Clifton Interiors offers it services primarily to individual’s exclusive private residences, property developers and architects. As part of Clifton's excellence ethos, Rosie Winston is a member of BIDA, the British Interior Designers Association and BIID, the British Institute of Interior Design. Studio 17 is a multi-disciplined interior design studio based in South West London. We look to provide a design service with the capability to offer exceptional design solutions combining cutting edge detail with high quality products. Our look is authentic, punchy, understated and functional. We look to create interiors that suit the lifestyle and personality of every client but we do it with originality. Our services look to engage on private homeowners, property developers/ investors and landlords (in both the rental and sales market). These services suit both large renovations or small single room projects fit for every budget type. 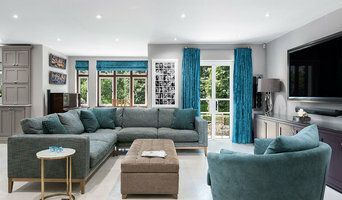 Services offered: Interior Styling Specification Service Home Staging Furniture Packs (for developers) Full Interior Architecture Service CGI Design If you have a project in mind please do get in touch, we will be more than happy to meet for a consultation when it’s most convenient, including evenings and weekends. Thomas Davies Kitchens is a Kingston-based design studio and manufacturing workshop. We are all about beautifully designed, quality kitchens that will last and look good for many years to come. Our kitchens are mostly bespoke and custom made for complete design freedom. We also offer one of the top brands of German kitchens, Nolte, which is designed and delivered with the same expertise and customer experience as our bespoke brand. We work with a great mix of people from homeowners to interior designers, builders and architects, in and around south London and Surrey. Our clients can expect a tailored experience that perfectly balances the need for professional services delivered with a personal touch. All it takes to start designing your kitchen is to get in touch. By the end of our first meeting we aim to have planned your future space in 3D. We look forward to hearing from you. DAY TRUE is an interior design showroom based in Maida Vale. We design Day to Day spaces that are True to their purpose. Architectural interiors that will remain timeless for years to come. We believe great design should be accessible to everybody, understanding that every project is different we tailor our service to suit your individual needs. Our passion for design drives us to deliver creative solutions by offering a holistic service from concept to completion for any size of project. Please feel free to pop in or get in touch to discuss your project needs, we'd love to help you. Alexander James Interiors - a highly acclaimed design practice offering a seamless delivery of bespoke design solutions, renowned for our eye for detail and ability to cater for any style without compromising on quality and service. Established in 1995, the company specialised in providing tailor-made luxury show homes and residential interiors, offering a highly personalised service whilst creating beautiful interiors for private individuals. The rapid growth of AJI began to make waves in the industry, and became regularly featured by many publications and television programmes, including 25 Beautiful Homes, The Sunday Times and Channel 4's From House to Home. Since then, AJI have gone from strength to strength, and in 2008 were named as Finalists of the Andrew Martin International Interior Designer Awards, described by the London Times as “the Oscars of interior design industry”. Our expansion in 2010 was marked with the opening of Alexander James International - our Hotel & Leisure division, and Alexander James Design and Build. Some of our recent projects include the Marriott Renaissance Hotel in Kiev, and the Hilton and Crowne Plaza hotels in Bucharest. The recent launches of our sister companies Lida Cucina and Pedini London have allowed AJI to offer clients the very best in Italian kitchens and fitted furniture, and signal our ambition to push the AJI brand even further in pursuit of new challenges, stunning interiors and unparalleled service. With our diverse team of designers and interior architects, combined with our wealth of knowledge and years of experience, we create beautiful interiors from concept to completion. After a degree in History of Art and several years working in the Events Industry, I graduated from KLC School of Design and founded my company in 2003. We celebrated 15 years in business this February. I enjoy collaborating with my clients to interpret their aspirations and establish what will work best for them. Each project is different and it is important to me not to impose a look. The plans and schemes I produce tend to combine classical and contemporary elements to create a comfortable, timeless, elegant and stylish home that reflects the people who live there and improves the way the property works and therefore, their quality of life. I have a wonderful team of architects, builders, curtain makers, upholsterers and carpenters in my address book. The business offers a complete Interior Design Service from planning to final installation and picture hanging. liaising with architects and builders, creating plans, colour schemes, furniture and electrical layouts, supplying curtains, sourcing furniture, antiques and lighting to purchasing the practical items. Attention to detail is key!